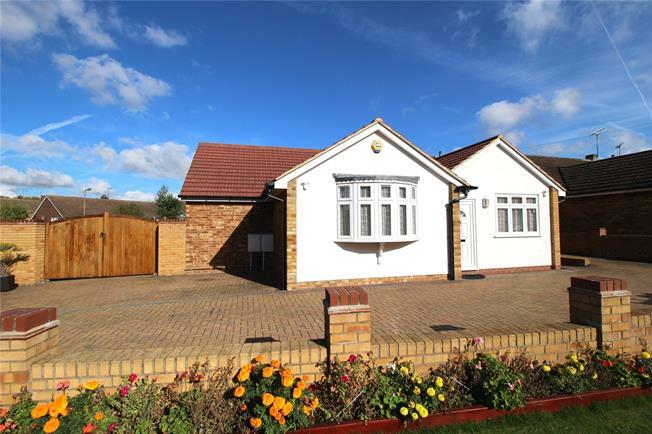 5 Bedroom Detached Bungalow For Sale in Brentwood for Offers in excess of £625,000. A well presented 5 bedroom detached bungalow well placed for Shenfield main line station and local schools. The property stands on a corner plot and provides flexible living - there are five bedrooms all with fitted wardrobes, reception room with French doors opening to the rear garden, a modern kitchen/dining room, smart family bathroom and separate wc. Externally there is ample off road parking for several cars, wooden gates lead to the driveway and detached garage with electric up and over door. The rear garden commences with a paved patio area with the rest being mainly laid to lawn. There are also further local shops nearby. Central Shenfield offers a range of local shops, bars and the main line station offering fast links to London Liverpool Street (approx. 22 minutes) and soon to arrive Crossrail service. Local bus routes are offered with main road links via A12/M25. Catchment schools are Long Ridings and Shenfield High School.